H ow did the 2018 fire season affect our state’s forests? What impacts are insects having on our trees? And what can the State of Colorado do to protect our natural resources? All of these questions are explored in a new report from the Colorado State Forest Service released this month. 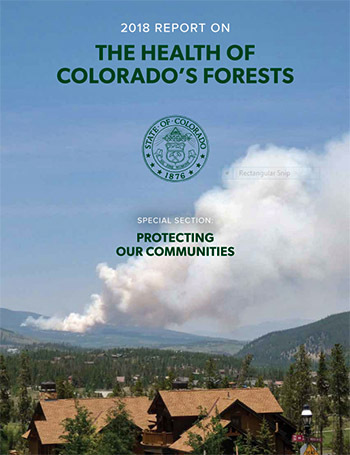 Each year the Forest Service, along with partners from the State of Colorado’s Division of Forestry, issue a Report on the Health of Colorado’s Forests. (Editions back to 2001 can be viewed online from our library). “Protecting our communities” is the theme of this year’s report. The 2018 fire season had the most acres of forest burned in any year since 2002. As Colorado’s population grows and pushes the boundaries of the wildland-urban interface, lives and property are increasingly at risk. The report discusses these challenges but also some of the successes of proactive fire management in the state during 2018. Spruce and pine beetles were another destructive element in Colorado’s forests this past year. The report includes maps of forest insect and disease activity in the state, using data from aerial surveys. It also offers suggestions on how to combat these insects and how increases in average temperatures, along with decreases in precipitation, have fueled insect activity Colorado. In addition to its information on forest insects, the report also examines how insects such as the emerald ash borer and Japanese beetle are affecting tree growth in urban areas.